Cabinets play a leading role in setting the style and appearance of any kitchen. Investing in high-quality cabinetry ensures that they will be very durable, saving homeowners the trouble of having to pour more money into their kitchens in the long run. As a designer, you’ll need to choose kitchen cabinets that are functional, robust and aesthetically pleasing. You’ll also want to give your clients the option of buying cabinets that are trendy if they are leaning toward a more modern look. Here are nine 2019 kitchen cabinet trends that are perfect for any modern kitchen. Contemporary: The contemporary cabinet style tends to be very sleek, with a minimalist layout and clean, crisp lines. Contemporary cabinet trends in 2019 will focus on browns, taupes, creams, and pure whites. They’ll also boast high-gloss or matte solid colors as well as vertical or horizontal wood grains. Contemporary cabinets do not have any ornate carvings or adornments – they focus mainly on simple and smooth surfaces. White & off-white: Although white cabinets are not a new trend per se, they will continue to be very common in 2019. White cabinets create a light and clean look in a kitchen. It’s a popular cabinet color for cottages, traditional-style kitchens, and modern kitchens. White cabinets can be paired with natural materials such as wood for flooring, dining tables, or exposed beams. Two-toned: The two-toned kitchen style is peaking in 2019. Having a single color in a kitchen can make it very boring and monotone, whereas a two-toned kitchen creates a nice contrast to add stylish drama to the space. 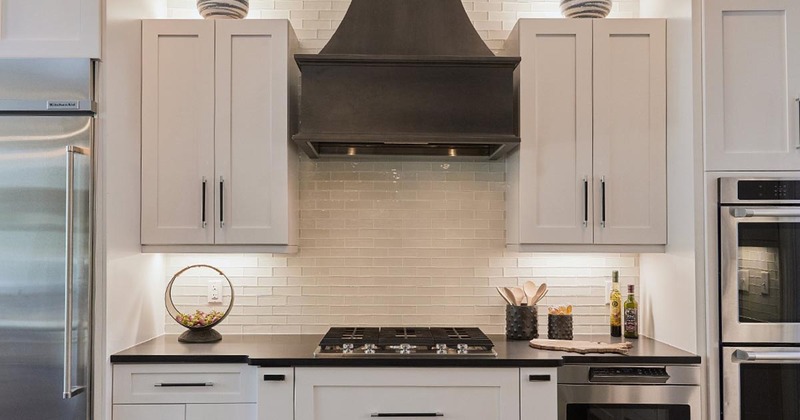 One of the most common 2019 kitchen cabinet trends is installing either dark cabinets with light countertops or white cabinets with very dark countertops. Designers are also opting for light upper cabinets contrasted with dark lower cabinets to help make the space look larger. Shaker door style: It is the most universal and timeless cabinet door style used in kitchens. A true shaker style has clean and simple lines. Most cabinets are available in the shaker door style, and they come in various materials. The simple, square-paneled doors look flawless with any hardware. The shaker door style is mainly used in industrial, contemporary and country-style kitchens. Open shelving: One of the main 2019 kitchen cabinet trends is open shelving. This allows clients to proudly display their dishware and to be creative with the decorative process by adding boxes, jars, plants, and other items. Open shelving gives a very modern feel to any kitchen, and it’s very convenient in terms of accessibility and organization. Dust collection is not an issue if the dishware being displayed is used regularly. Ample storage: Storage is one of the most (if not the most) important elements in a kitchen. It keeps kitchens organized, making cooking and baking more efficient. Built-in storage is a kitchen cabinet trend that will be very popular in 2019 and beyond. Whether you offer your clients kitchen cabinets with built-in lazy susans, pull-out racks, or pull-out pantry systems, they’ll be very grateful when it comes time to using their kitchen. Drawers: 2019 kitchen cabinet trends call for drawers instead of cabinet doors. Drawers make it easier for people to reach all the items they have stored, whereas cabinet doors force them to reach into the back to grab certain items. Deep, wide drawers are being used more frequently over cabinets with doors because they can be accessed in one, easy motion, making them more practical than other types of kitchen storage. Glass doors: The elegance and beauty of glass kitchen cabinet doors make it a popular choice in modern kitchens. They make any kitchen look bigger, and they allow clients to display striking dinnerware and other decorative items in a dust-free zone. Using an x-lite mullion pattern with a framed cabinet door is a great way to enhance any cabinet project, combing functionality with stylish design. Black & blue: Black and blue cabinets are showing up in many different kitchens, including contemporary, traditional and galley kitchens. Using black and blue kitchen cabinetry to contrast a kitchen with plenty of natural light provides a fresh look and feel to the space. These dark colors also pair perfectly with modern kitchen hardware, including gold, copper, and stone. Check out our webinar presented by Serenade Cabinetry to learn more about upcoming 2019 kitchen cabinet trends.